TEDDDYYYY BEAAARRRSSS!!!!!.... These cute stuff admired by many have been the symbol of love. When you like somebody, you can give him or her a teddy bear just to let the person know how much you care for them. 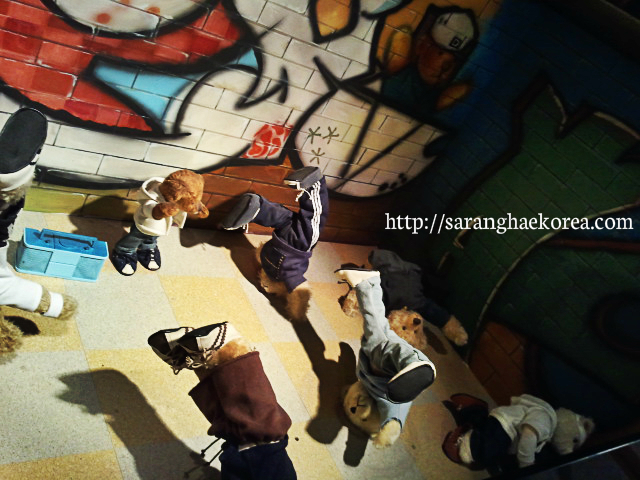 But here in South Korea, Teddy Bears are more than just an enigma of love and care. 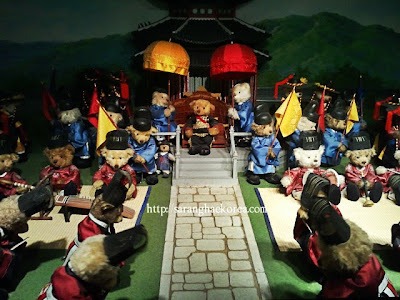 There exists a so called Teddy Bear Museum at N Seoul Tower, but these are not just ordinary teddy bears because these little and lovely stuff have a task to do, to tell you the history of Korea and to show to you the Korean culture and traditions. Lovely isn't it? 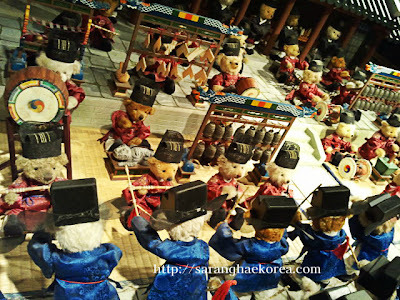 The Teddy bear museum has two halls, the first hall is a diorama of Seoul that roots back from the Joseon Dynasty. 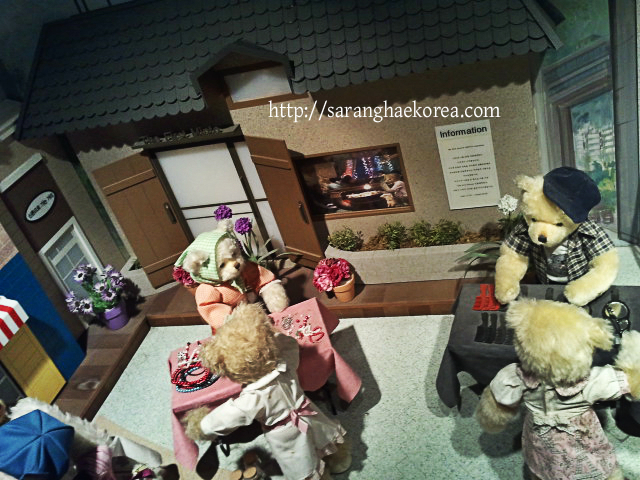 The second hall on the other hand is a diorama of Modern Korea. Let me give you a special treat by showing to you what's inside these halls through the lens of my camera. In the first hall, you will walk down memory lane. It's like a time machine that would let you travel back to the Joseon Dynasty. You will be welcomed by these big bear in its traditional aura. This is how teddy bears used to look like. 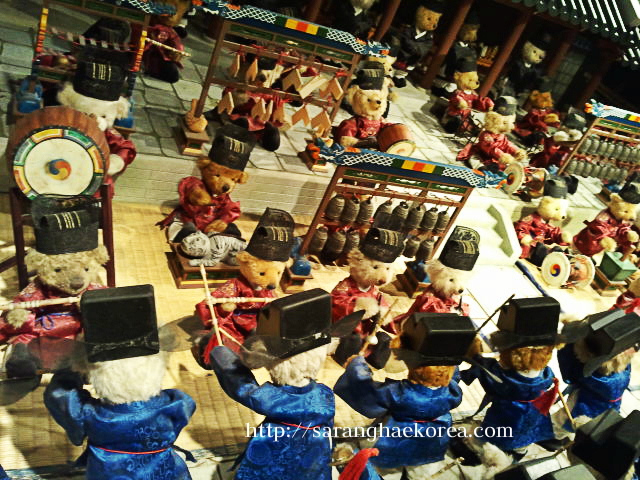 When you enter the hall, these teddy bears (some of them are actually moving), shows how Koreans in ancient days manually labored to build buildings. There are no machines yet during that time, ergo manual construction is the only way to build houses. You can also see these musical band with the performers wearing the old traditional Korean clothing. This means that Koreans are really into music ever since their civilization begun. 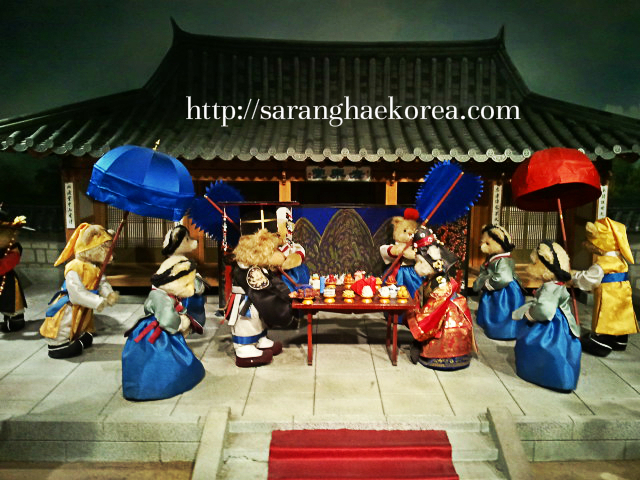 This one shows the traditional way of Korean wedding. This is how they conducted wedding ceremony. 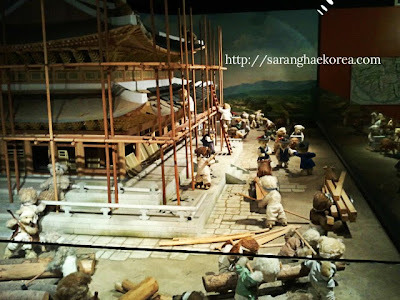 Korea continued to grow until they reached the Kingdom era, that is the whole nation is being controlled by the Kingdom. The people started to build villages and community. They also started to develop their own foods and style of houses. This is the start of Korea's most renowned food, the Kimchi. And the style of the housing is something you could only associate to them. The Joseon dynasty has implemented a well-balanced political system. In pursuit of better ruling government, the Kingdom started to reign over the nation. From that junction, Korea started to establish a better living condition. Electricity has been installed. Public Transportation has been improved. And Korea has never been the same until new technologies and new form of governance have been developed. The second hall which is the diorama of the current living condition of South Korea is more alive and any Koreans or even non-Koreans living in this modern era can greatly relate to. 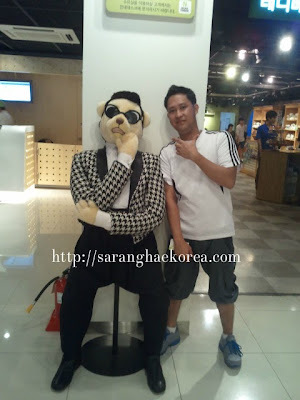 I guess you know who this teddy bear is imitating. Yes, it's PSY, the most famous K-pop artist today. He will welcome you if you enter the second hall of the museum. In the second hall, you will see these improved and modern buildings. This is totally different from the first hall. 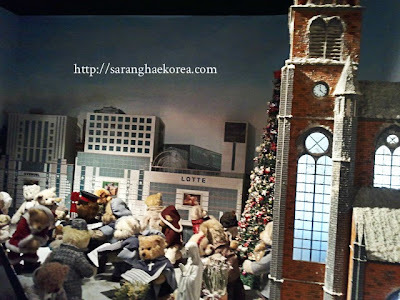 You can also see here that Korea is now influenced by other religions as some of them are celebrating Christmas. And of course, who could neglect K-pop? One of the greatest influence of Koreans to the world I think is their music. It penetrates even to Hollywood despite the fact that the lyrics can be barely understood, take for example the Oppa Gangnam Style by PSY. 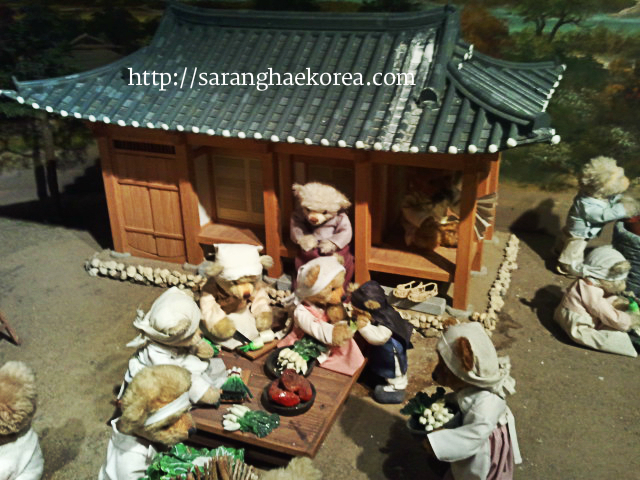 Nowadays, Korea has a lot of themed park to offer to tourists. You can enjoy amazing rides and sights just like what other themed parks in the western world could offer. And speaking of Western World, Korea does not remain introvert in their own culture. 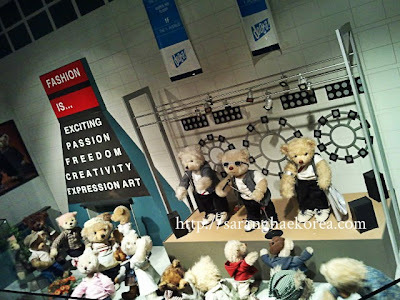 Although Korea's culture has strong foundation especially the language, brands and ways of Western culture have somehow penetrated the country especially to the young ones. When it comes to fashion and styles, Korea has improved from the traditional Hanbuk to the modern way of grooming. But I am still dying to wear traditional Korean clothes. Despite the modernization, I can still see some Koreans wearing Hanbuk. Hip Hop, anyone? Yes, the hip hops and the grafitis, the most common scenes you can see in the Western community have also penetrated South korea. How about Korean movies and TV series. I know you know this, a lot of people, even non Koreans, are loving the way Koreans make their story marketable to the audiences. I like the concept of the teddy bear museum because it tells the important story of how Seoul has evolved from the traditional way of living in the Exhibit Hall number 1 to the modern way of living in Exhibit Hall number 2. Kids will surely love to visit this place, and at the same time they will learn a lot from this amazing museum at Namsan Seoul Tower. 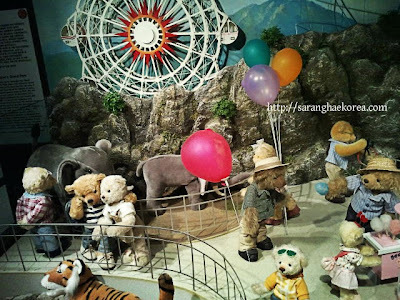 - Ticket price is for Teddy Bear Museum only and is not including observatory tower area. 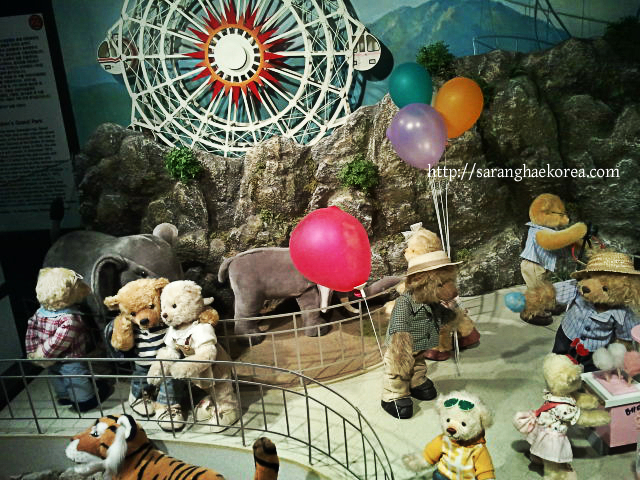 - Babies under 36 months old are free to enter Teddy Bear Museum, but parents have to accompany them all the time. 1. By shuttle bus – You can take Namsan Sunhwan Suttle Bus (number 02, 03, or 05). Take subway to where you’re from and alight at Myeong-dong station, Line 4, Exit 3. You can find the shuttle bus every 15 – 20 minutes. Price: 950 KRW cash or 850 KRW using transportation card. 2. By Seoul City tour bus – Take the yellow bus in front of Gwanghwamun Donghwa Duty Free (Gwanghwamun Station, line 5, Exit 6). The bus interval is every 30 minutes and will take around 2 hours to reach Namsan. Bus is available from 9 AM – 9 PM. 3. 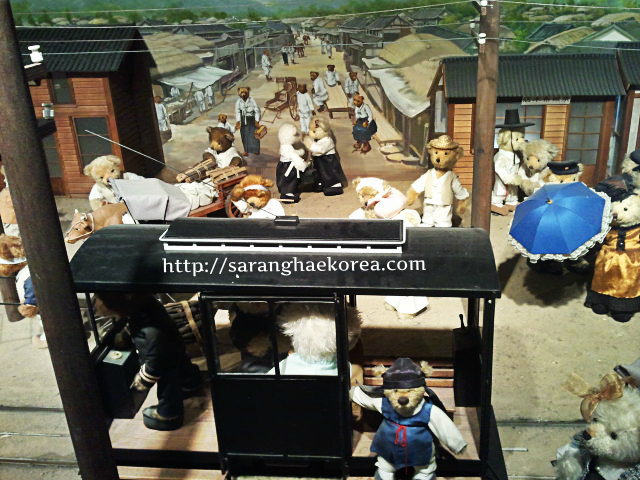 By cable car – This is the most famous model of transportation to reach Namsan. You can take the cable car by walking for about 10 – 15 minutes on the right side of Pacific Hotel after you came out of Myeong-dong Station, Line 4, Exit 3. Operating hours 10 AM – 11 PM. Price: 6,000 KRW (one way ticket) or 8,000 KRW (return ticket). Yay cute! This is great especially for kids. Not just for adults but kids would love it! Cute naman ng stuff dito. I would love to hug that big bear. Is this museum open every day? Yes, they're open everyday until 11 pm. Wow. that's BEARy cute. 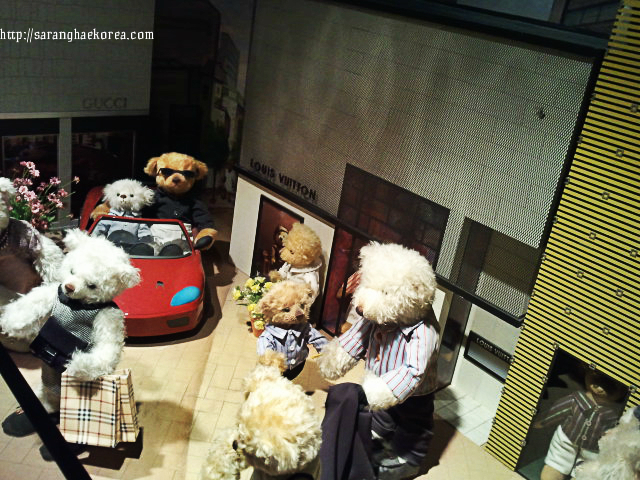 Who would have thought Korea has these adorable collections of teddies. Wanna hug one of those. 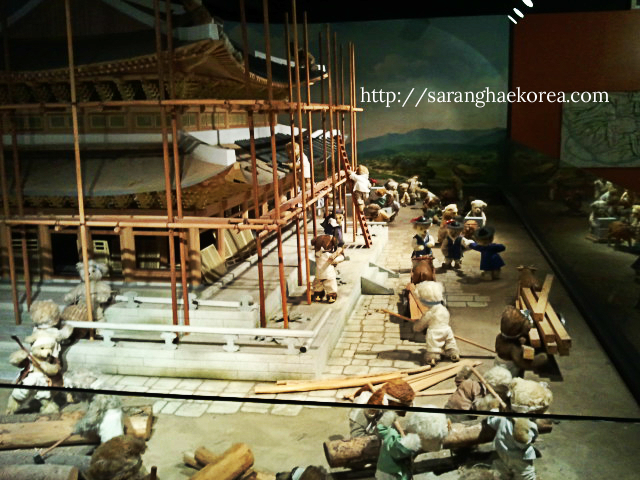 Korea has a very rich culture and history. Great post Sir. There used to be a Teddy Bear Kingdom in Hong Kong but this one looks better. My daughter will love this. I hope our family gets to see this for ourselves. 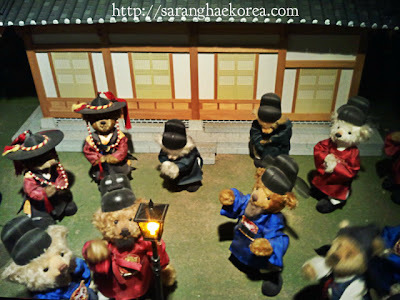 This museum showcases the history of Korean culture. Just asking Why Teddy Bear? 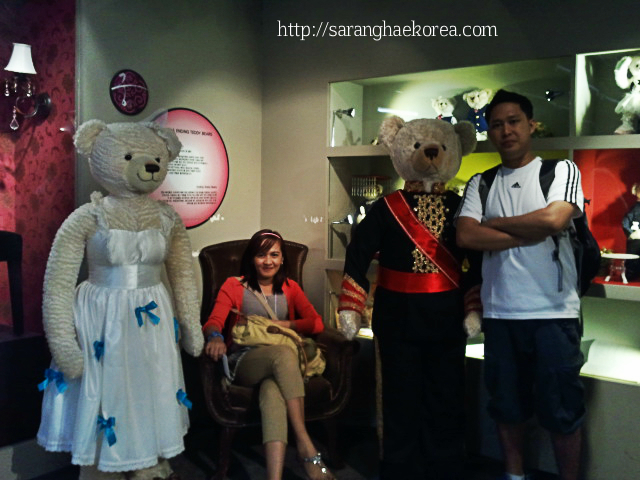 Cool stuffs and I love that bear :) Full of Korean history indeed! Thanks for sharing your stuffs. awesome and cute teddy bear, I want one now to give to sister. Its's interesting how that museum displayed the past and current period of Seoul using teddy bears. That's one way of putting a twist into things. I suddenly remembered my trip to South Korea. I had my picture taken with this really big bear. 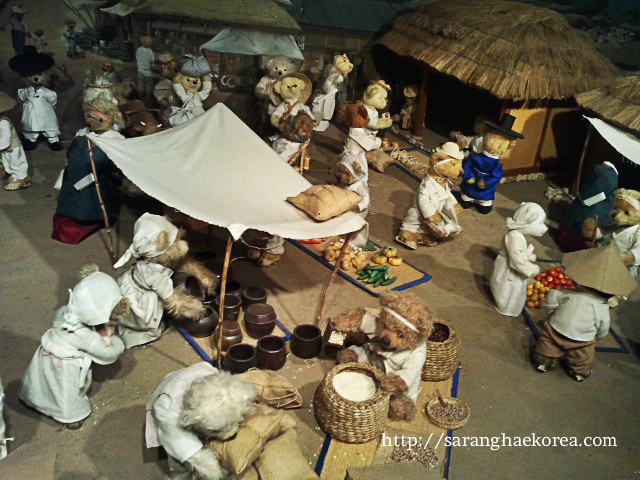 But it was back in Jeonju. 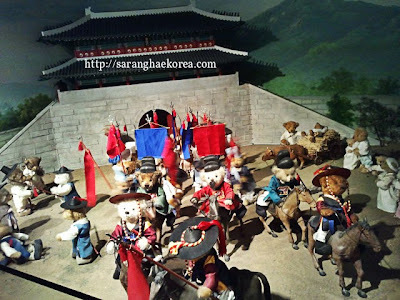 Seems like I've been to Korea with this post of yours, and the great idea using Teddy Bears presenting the History and Culture of Korea. God Bless Korea! Wow! Lots of cutie stuff in here! I want to visit that place too! I hope we have a museum like that here in our country too! Teddy bears all around... kids will surely enjoy taking sight of every huggable stuffed teddies in this museum along with their oldies who will definitely be delighted as well.